San Francisco astrologer Julia Bonatti never thought murder would be part of her practice, but when her former boss and current client asks for help she agrees to go undercover at his law firm. Three people have received death threats and the only common denominator between them is a case long settled--the infamous Bank of San Francisco fire. Julia’s astrological expertise provides clues but no one wants to listen. Before she can solve the mystery, two people are dead and her own life is in danger. Julia must unmask the killer before he, or she, takes another life. 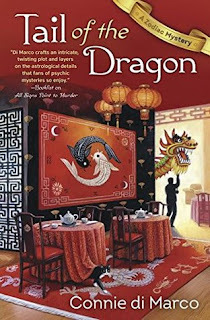 One of the best cozy mysteries I have read this year! I thought for sure I knew who, but little did I know what author Connie di Marco had tossed into the mix. Needless to say, I was shocked and screaming holy cow, I never saw twist one coming. This is my first book by this author and I am so glad I tried it. I love how the author brings the location and Julia to life as you read. Kudos on the research the author did to bring Julia’s first job as an astrologer, I love getting to know what the characters do day by day. You can’t ask for anything better when you enjoy the characters, mystery and that you didn’t have to read the first books in the series in order to keep up. FTC Disclosure: I voluntarily reviewed an Advance Reader Copy of this book from NetGalley and the publisher. I was not required to write a positive review, all the expressions above are my own opinion.